Many marketers have been confused by buzz words used to describe database marketing, including CRM, One to One, Relationship Marketing, etc. Some CRM proponents seem to argue that all you need for successful marketing is a huge data warehouse, and advanced drill-down software. What a mistake! The marketer uses the database and related software to create personal messages to the customer. Responses from the customer are fed back into the database, where the software is used to do “back end analysis” to determine how successful each group of messages were, in comparison to some control messages. The marketer measures response rate, sales, return on investment, the retention rate and lifetime value. Things that don’t work are discarded. Things that work are redoubled and expanded. The point in the diagram, however, is that the only thing that touches the customer is the message, not the database and not the software. The messages are created by skillful, imaginative and diligent marketers. 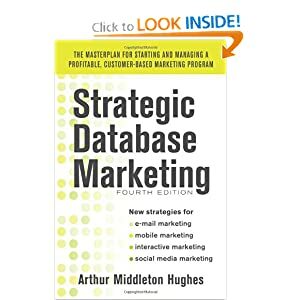 The database and the software are essential, but they are only aids to a proficient marketer. Too often, proponents of CRM point to this diagram and make it sound as if the database (or data warehouse) and their wonderfully user friendly software will increase sales and retention. They will not, and they cannot. Without a talented marketer, the warehouse and software are a useless waste of money. In fact, in most cases today, marketers have much more data available to them than they actually need or can use in developing marketing messages. Most small purchases made more than three months ago, can seldom be used profitably in marketing messages. Yet, a data warehouse is often designed to hold all transactions over a three year or longer period! Proponents of CRM say that they will send, “The right message to the right person at the right time”. It is unlikely that such messages could be developed using data in even the most elaborate data warehouse. “Joe Williams will buy Product X within the next 90 days”. No warehouse can possibly contain the kind of information which would lead this statement to be true for more than a very small fraction of the customers. You cannot predict the future of an individual with data in a warehouse. What you can do is to predict the actions of a segment. “30% of the 10,000 customers in Joe William’s segment will buy Product X within the next 90 days.” This statement can be true. You can keep data in a database necessary to predict the actions of a segment. With this information, you can develop communications to those in Joe William’s segment, promoting Product X. These messages will be meaningful to 30% of the recipients, even though they do not all buy from you. To be successful in marketing, therefore, you need clever marketers who can use their database and software to predict the actions of people in segments, developing messages to these people based on these predictions. Don’t go overboard buying huge data warehouses. Concentrate on the information necessary to support skillful marketing messages aimed at customer segments. A marketing database can usually be developed for about 10% of the cost of a data warehouse, but have the same impact on customer behavior, when used by a diligent marketer. It’s the message that does the trick, not the warehouse.